Facebook is the first place you normally go when you need information about someone. But what many people I found out are not aware of is that it’s possible to look people up on Facebook by their mail address and phone number. If someone is mailing you or left his email on a site somewhere, big chance you can find his name, profile picture, social connections (friends and family) and location by just searching for that email address, even when he’s using a pseudonym or nickname. Facebook makes doxing more easy than ever: you don’t even have to know the full name in order to get all his personal details. To do so, just go to Facebook.com, but instead of searching for a name, enter a phone number or email. The corresponding profile should show up now. Some use cases: next time you have an unknown caller, just enter the number in Facebook and maybe you’ll find out who it is. Same thing if you want to know the person behind a forum profile but you only have one mail address. Or think about this: an advertisement on Marktplaats.nl / Ebay with a mobile phone number to contact the seller. You can easy verify if it’s legit now. There are many ways this can be an useful tool. I have found a few people myself by this, and people are always surprised when I know their full name and details after just getting one WhatsApp message. How to disable this for your own profile? Facebook placed annoying popups a while back to “ask” you to enter your number in order to “make your account more secure”. Great chance you fell for this and also entered your own mobile phone. If you did that, then probably everyone can find you as long as they have your number. Luckily it’s easy to disable. 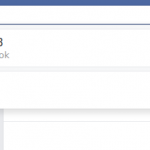 Edit your privacy settings on Facebook. Go to: Settings > Privacy > ‘Who can look me up?’ and change ‘phone number’ to ‘Friends’. Here it’s also possible to (partly) disable lookup by your email address. I have set both to ‘Friends only’ as you can see above. It is always a good idea to check all the privacy settings to make sure you’re not sharing things you don’t want. I personally have set my profile as strict as possible, also for the things I’m posting. People should be careful with what they put on the public web, or at least be aware of what a stranger can see. It is most of the time more than they realize. ← Read articles on social media for free. Good idea?